If you reside in a big city, there’s a good chance that you live in an apartment and an even better chance that your bathroom is as small as a closet. Hint: If you can close the door while in the shower, you’ve got a small bathroom! Or maybe you have a decent-sized bathroom in a house, but with three or four people sharing it, the size of it seems to shrink. You've put a lot of effort into maintaining, repairing or replacing your roof, your gutters and your siding; you've hired a landscaper to ensure that your front yard has tremendous curb appeal; you've outfitted your backyard with a fantastic patio; you've updated the look of your house with a fresh coat of paint and new shingles; and you've made sure that your home is properly insured. So now comes the fun and (mostly) effortless part: transforming your small bathroom into a room that feels more spacious without actually knocking down the wall to Junior's room next door. When space is at a premium, think ships and trains. In other words, everything should have more than one use, and every inch of space should be used. Just because you can’t afford to renovate this room yet doesn’t mean that you have to feel like you’re suffocating each time you brush your teeth. To paraphrase a well-known saying: Don’t get angry, get creative! If you’re not using your spice rack in the kitchen (I mean really, how many spices does a person need? ), put it to use in the bathroom for your smaller bottles and jars. If you don’t have a lot of wall space, you can install multiple towel racks on the back of the bathroom door to hang your towels and facecloths and keep them out of the way (and off the floor!). Affix a hanging shoe organizer to the inside of the sink cabinet door for your hair styling products such as brushes, curling irons or blow dryers. Or shoes. Who are we to judge? 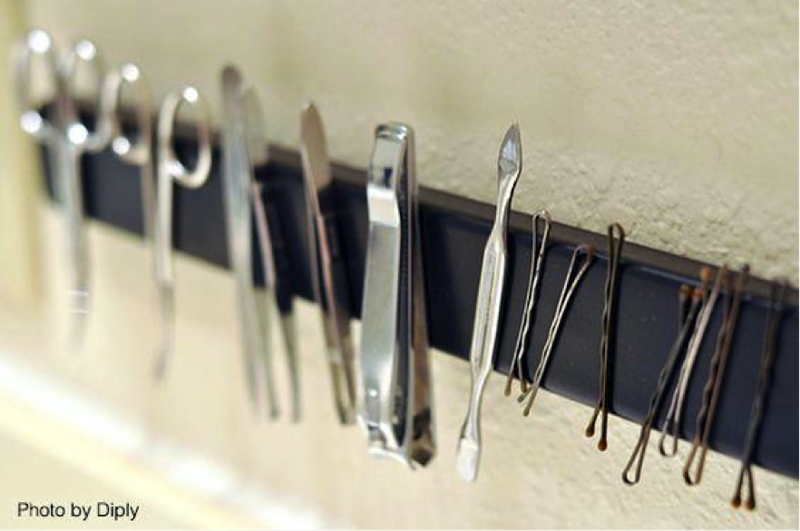 Attach a magnetic strip to the inner wall of the medicine cabinet door and keep your tweezers, bobby pins, and metal emory boards – all those things that tend to get lost at the bottom of a drawer – neat and organized. Try putting up a shelf above the door to store your extra towels, rolls of toilet paper, and anything else you want to forget about. Like that letter from the IRS. 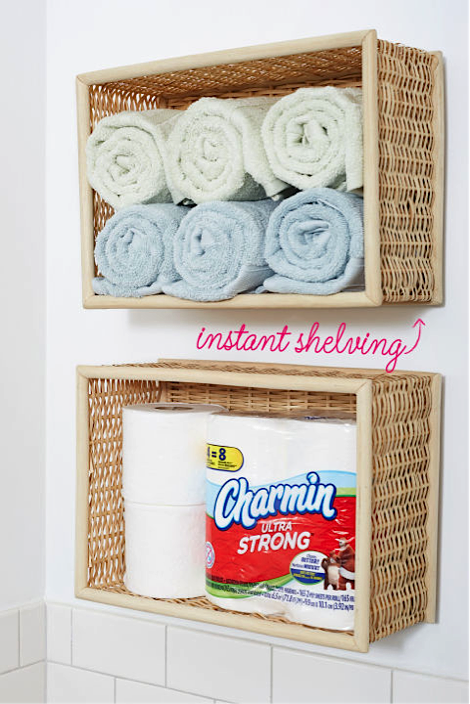 If you don’t have a lot of cabinet space but there are plenty of blank walls, mount wicker baskets on the wall for additional, secure storage. Hang an extra shower rod on the inner wall of your shower where you can hang baskets for your shampoo, loofas, and shaving supplies. Just be sure to get waterproof baskets with draining holes! 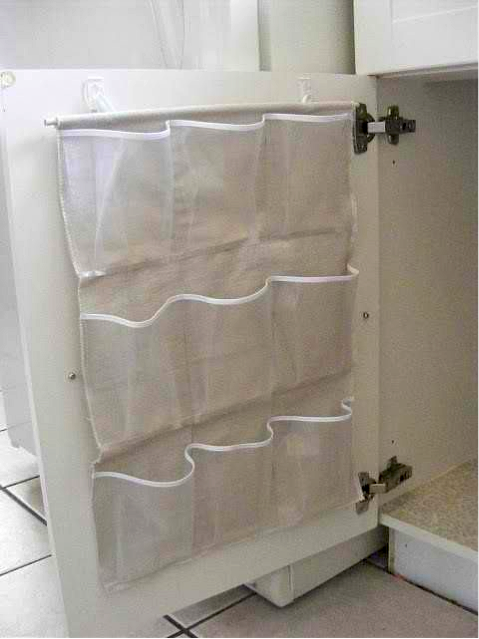 You can also hang a mesh pocket organizer on your shower rod, on the inside of the shower curtain, for extra bottles of shampoo, body wash, and all your family’s scrubbies. This one works only if you are about to install a new bathtub. Turn your tub into a pull-down drawer system and make use of that wasted space you never knew you had! I’ve never actually seen this, but it seems like a good idea. Kind of like a James Bond-styled bathtub. A blog by Signature Exteriors roofing contractor in St. Charles, MO!